In the middle of a busy season, the last thing you need is a complicated interface. Built on the Android™ operating system, the flexible platform lets you choose the application you want to use based on the work you need to do today—FmX® Plus or Precision-IQ™. The FmX Plus app leverages the same familiar workflows and menus of the Trimble FmX integrated display so there's no need to retrain or learn new software. The Precision-IQ app provides a graphics-rich and streamlined workflow designed specially on the TMX-2050™ display and for today's leading grower. With industry leading performance and reliability the AgGPS FmX integrated display can handle all your precision ag needs. From guidance to steering, rate control to yield monitoring; the FmX has you covered. Industry-leading 220 channels for unrivaled GNSS tracking. Two GPS+GLONASS receivers means precision with the vehicle and the implement behind the tractor-where it really matters. Toggle between plain and 3D views or zoom in/out with just a tap of your finger. 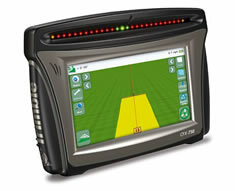 The AgGPS FmX display supports every application offered by Trimble. 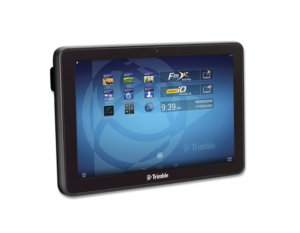 The newest touch screen display from Trimble offering affordable guidance, steering and precision agriculture functionality. 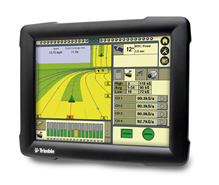 Use the 750 display to maximize your efficiency when planting, spraying, spreading, and strip tilling by adding Trimble's Field-IQ crop input system, and upgrading to receive GLONASS satellites. 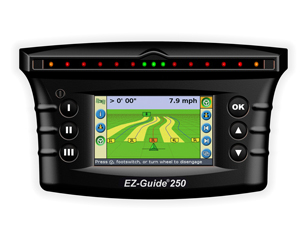 New entry-level lightbar guidance system With common-sense interface and a color screen, the Ag GPS® EZ-Guide® 250 is easy to operate right out of the box. Plus, you can upgrade to the EZ-Steer® 500 assisted steering system , delivering a total package priced far less than the competition.